I believe a great deal of wonderful articles have already been written on the topic of Waldorf doll-making and, seeing that my own dolls follow closely in the steps of tradition in terms of their anatomy, with the same tightly-rolled wool for the head and similar stylized arms and legs, all made from natural materials, I have decided, instead, to write on doll fashion. It is the making of a doll’s wardrobe which allows me to fully pursue my creative fancies and develop my own ideas. After perusing many fashion catalogs and blogs, I strive to create garments which would reflect my love of the simple and yet elegant, of beautiful warm color combinations, and of small intricate details. I make doll dresses with the same careful attention and love with which I clothed my own daughters when they were younger. Sometimes, I may be inspired by a simple combination of colors, such as a pattern of complementary bright orange and blue which I used in creating Solène. Placed side-by-side, they seem to invigorate each other and endow the doll with a unique personality of its own, bright and sunny as her name implies. Other times, my eye may be caught by a work of art in a museum, such as a masterpiece by Amedeo Modigliani, in which I, again, may fall in love with the color scheme. 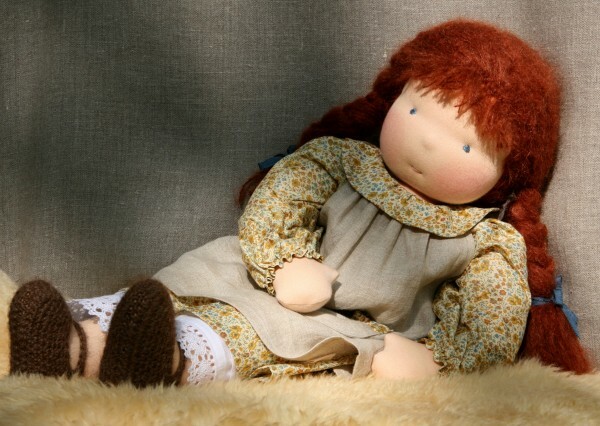 One of my earlier dolls, another redhead, reveals this love of mine for working with soft yellows and browns. Although I prefer working with contemporary styles, sometimes, especially after visiting an exhibition featuring historical fashion, I may get inspired to re-introduce a style from the past. The blue lace dress I recently made, for example, was inspired by a 19th-century French ball gown, and, in making it, I used the finest silk, lace, and delicate little pearls I could find to create the most authentic experience possible for the doll which had decided to grace a ballroom with her presence. Sometimes, a character from a story may strike my imagination, such as in the case of Sarah from A Little Princess by Frances Burnett. 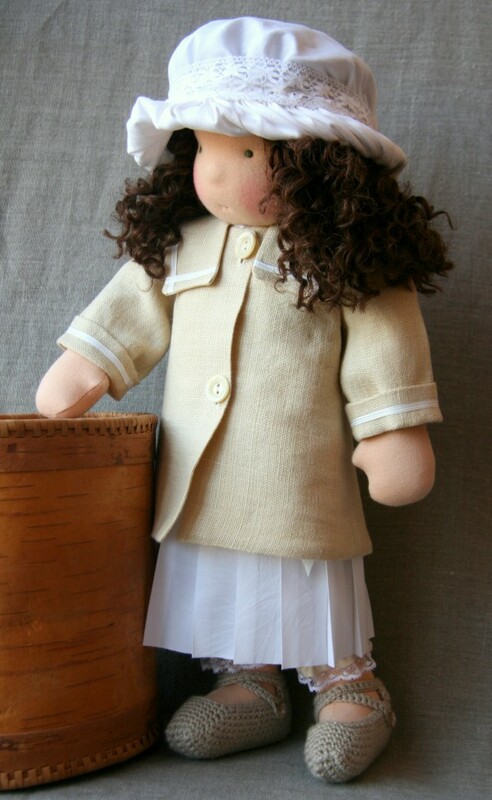 In her white silk, pleated, low-waist dress, soft linen coat, and small hat, she envelops herself in elegance and grace so appropriate for a little princess. Finally, I love finishing off monochromatic outfits with a bright dab of color. 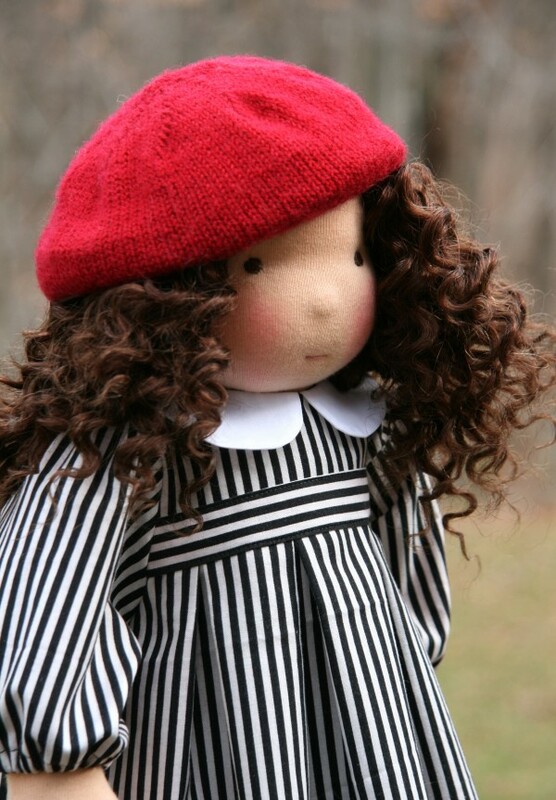 With her bright red beret to set off her black-and-white couture dress, this doll seems ready to join the casual strollers in the boulevards of Paris. 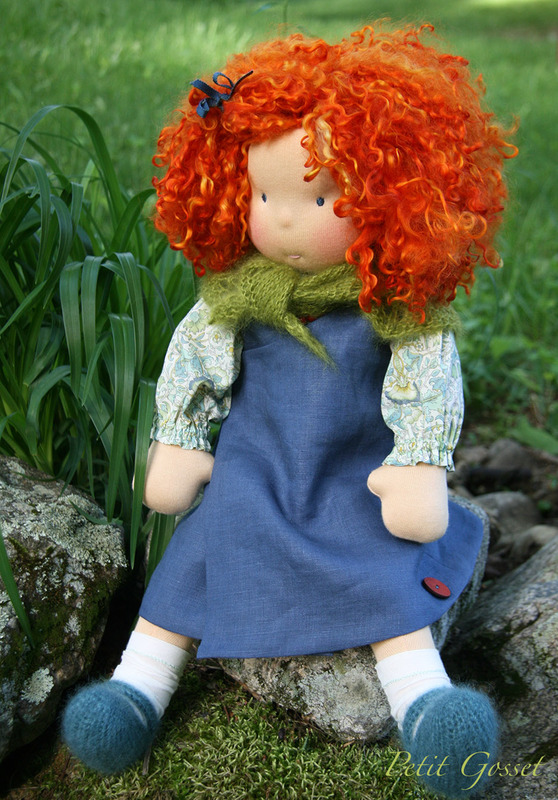 As a thank you to all of you, wonderful doll-makers and doll-lovers, I would like to offer a give-away of one of my tutorials/patterns to dress your doll. The winner will have the option of choosing between a Dress or a Hooded-coat pattern found in NobbyOrganics etsy shop, which will be sent via email as a pdf file. Both patterns are for a 18-20” doll and are easy to follow. To enter, visit the shop, then come back here and leave a comment saying which of the two patterns is your favorite, along with a way for me to contact you if you win. The giveaway will run until 9:00 pm EST June 10, 2013. The winning comment will be selected using a random number generator, and announced here on Tuesday, June 11. If you would like to learn more about my work please visit Petit Gosset Blog and FB Page! Thank you!